The perfect plant for an ornate container and with a little care will last a lifetime. Even before the flower stems appear the bright green, strap-like leaves are a lovely sight and heighten the expectation of the blooms to come from midsummer. Prepare yourself for a mesmerising display every summer. Place in a sunny spot and enjoy this African native in your garden! Supplied as 3 plants in 9cm pots, ready to plant out when all risk of frost has passed. 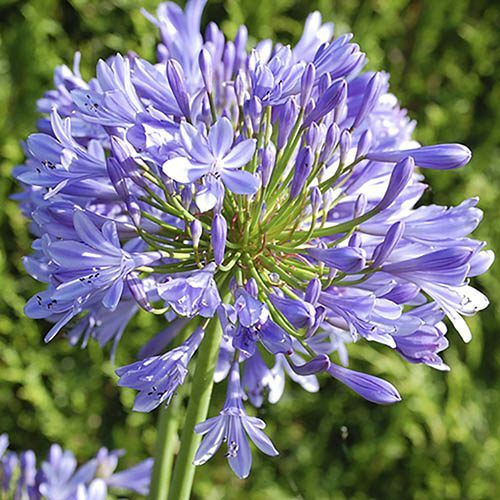 If you want to grow a plant that will get tongues wagging, try this African lily. There's nothing finer than a large Agapanthus in full flower at the height of summer, creating an eruption of brilliant blue. Its head-turning blooms perch on lofty stems in mid and late summer, adding a Mediterranean touch to borders or to patio. It's the perfect plant for an ornate container and with a little care will last a lifetime. Even before the flower stems appear the bright green strap-like leaves are a lovely sight and heighten the expectation of the blooms to come from midsummer. Then as summer moves into autumn, agapanthus continues to provide interest long after the flowers fade as the sculptural form of its seed heads. Supplied as 3 plants in 9cm pots, ready to plant out when all risk of frost has passed, simply place in a sunny spot and enjoy this African native in your garden over summer! Supplied as a pack of 3 established plants in 9cm pots. You will often get more flowers when the roots are restricted, so definitely a plant that does better in a pot (plus it can be moved out of the worst of the winter weather). Feed with a general-purpose fertiliser monthly from spring until flowering, then, from the end of September reduce watering and feeding to allow the foliage to harden. In colder parts of the UK, cover the crown of the plant with a deep, dry mulch to protect the plants from hard frosts, or grow in a pot so they can be overwintered in an unheated greenhouse.